HP: “Special K Nourish cereals and bars are all about real ingredients you can feel good about eating. It’s time to ditch the doubt and devour. No second-guessing, no hesitation, no holds barred. Don’t just eat it, #OwnIt”. Go ahead. Eat. Really eat. Dig in. Dig into real food, with real ingredients. No second guessing, no hold back. Ditch the spoonful and grab a fistful. Ditch the doubt. Better yet. Devour the doubt. Devour cranberries, almonds, chunks of dark chocolat and multigrains in new Special K Nourish. It look good because it is good. 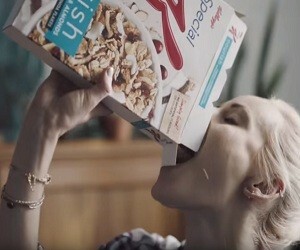 New Special K Nourish cereals and bars. Don’t just eat it, own it.